The Date Range Picker, which can be found at the upper right side of any Stats page, allows you to choose the time frame for the displayed activity. If you want to download the information generated in your Statistics page, simply click the Export link at the bottom of the page, and you’ll be given an .xls file with all the details. Project-level stats can be accessed using the Stats button in the Project page, and are grouped under two tabs: Reports by Contributors and Reports by Languages. On the Reports by Contributors page one can find the following information about contributors: name, email and the number of strings they’ve translated. Clicking on the contributor’s name reveals more details regarding their translation work: the language(s) in which translations were made, the number of translated strings (Translations), how many words and characters these strings represent (Words, Chars) and what percentage of the language was translated (Percentage). Having a Reference Language set on the project will make two more columns appear: Reference Words (RC) and Reference Chars (RC). In Reports by Languages, one can see all the languages in the localization project with translation activity, in the period selected with the Date Range Picker. The percentage of completion and the number of translated strings is also available for each localized language. To see who contributed to the languge localization and to what extent, just click on the language. 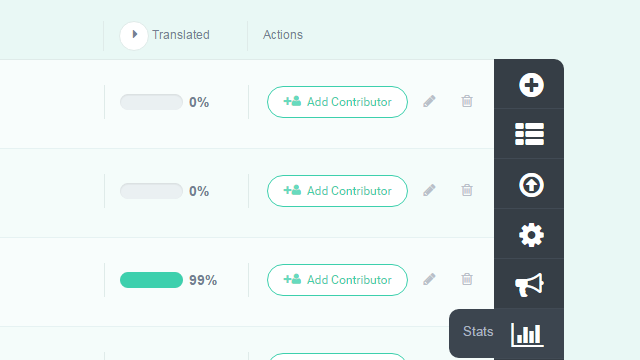 Contributors can access their own statistics by clicking on the Translation Stats button in the Language page. Here, they can see their contribution to the language localization process: Words, Chars, Translations (number of translated strings) and the Percentage of completion. For software localization projects with labels, that have a Reference Language set, Reference Words (RC) and Reference Chars (RC) are also visible.